We offer Mesh Office Chair from Inspace India. 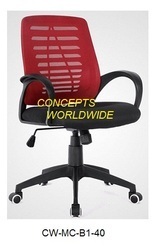 One can avail a vast array of Mesh Office Chair from us at competitive prices. Our product range is extensively demanded in various offices and corporate houses for its premium quality, high reliability anf high comfort. A duraflex mesh back and deep cushioned seat combine to form a solid piece of design that takes the user’s needs in hand. Torso’s biggest strength is its versatility. Simple enough to be used at workstations but also boasting the ergonomic power to function as an executive chair, especially when a sleek chrome base is chosen as one of the configuration options. Application: Office, Company, Shops etc.